Crossbreeding is widely used by famers milking twice-a-day (TAD) to increase farm profitability. Effects of crossbreeding on farm productivity and profitability have not been investigated in farms practicing once-a-day (OAD) milking. The aim of the study was to estimate breed and heterosis effects for lactation length (LL), total yields of milk (MY), fat (FY) and protein (PY) and average somatic cell score (SCS) in cows milked OAD or TAD. Records from 36,276 Friesian (F), 31,560 Jersey (J) and 90,081 crossbred (F×J) cows that calved in spring between 2008 and 2012 were used. Compared to J cows, F cows had a higher MY (657 kg in OAD and 1034 kg in TAD), FY (2.9 kg in OAD and 7.8 kg in TAD), PY (13.6 kg in OAD and 22.4 kg in TAD) and SCS (0.28 in OAD and 0.05 TAD). Lactation length in OAD cows was five days shorter than in TAD cows (P<0.05). These results show a significant interaction between breed and milking frequency for production traits (P<0.001). Expressed as a percentage of the average of parental breeds, first-cross heterosis effects ranged between 4.92 to 6.84% for production traits, and were similar across milking frequencies. 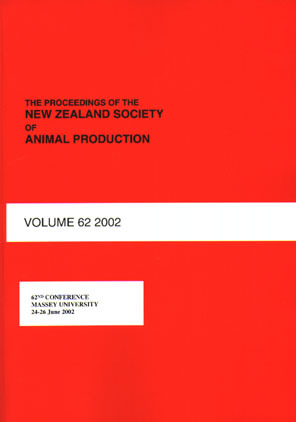 The estimates of breed and heterosis obtained in this study can be used for simulation studies to evaluate the profitability of crossbreeding systems under OAD and TAD milking systems of typical New Zealand dairy farms.